It’s happening, the City of Toronto has transformed into a winter wonderland, minus the snow. 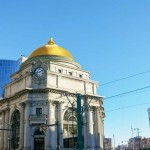 Everywhere you go, there are delightful sounds, great food, holiday decorations and special events popping up around the city. 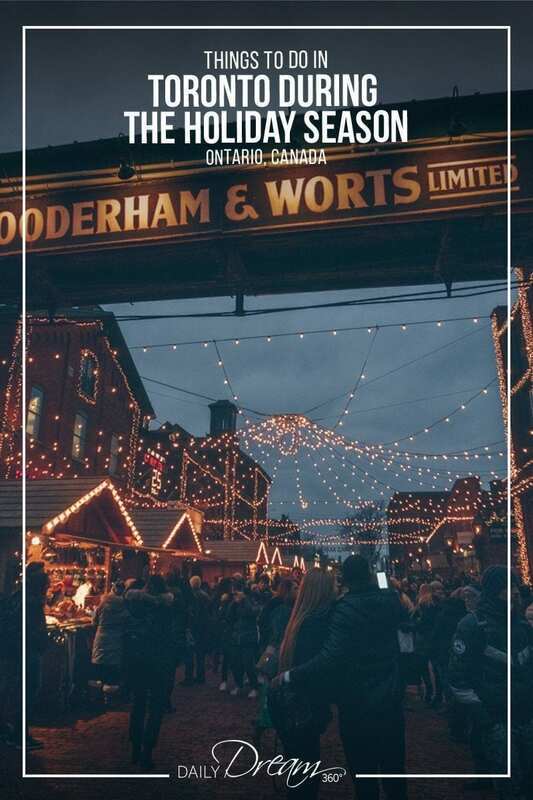 In this post, I’ve put together a list of things to do in Toronto during the Holidays. 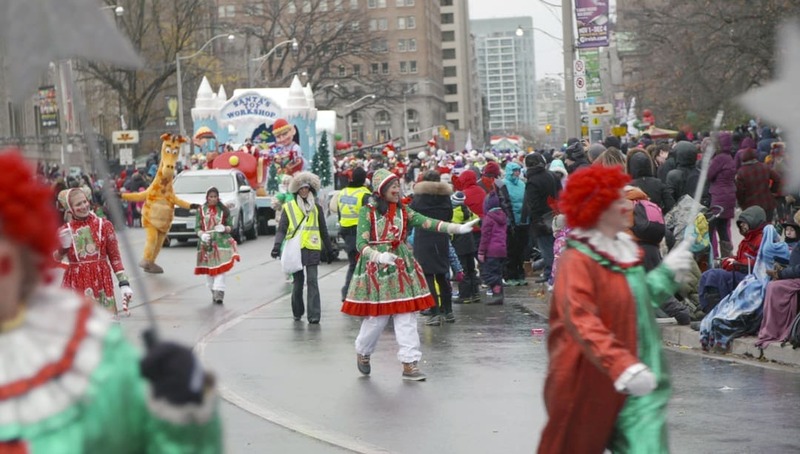 Kick off the holiday season in Toronto with the annual Toronto Santa Claus Parade. Santa makes his first appearance in Toronto mid-November at the annual Santa Claus Parade. It is the official launch of the holiday season in Toronto, and it has been a tradition for over 100 years. On the 3rd Sunday of the month, downtown streets are closed, and people line the parade route to enjoy all the floats, musicians and fun. Usually a week or so after the Santa Claus Parade, the Cavalcade of Lights is an evening celebration for the whole family. 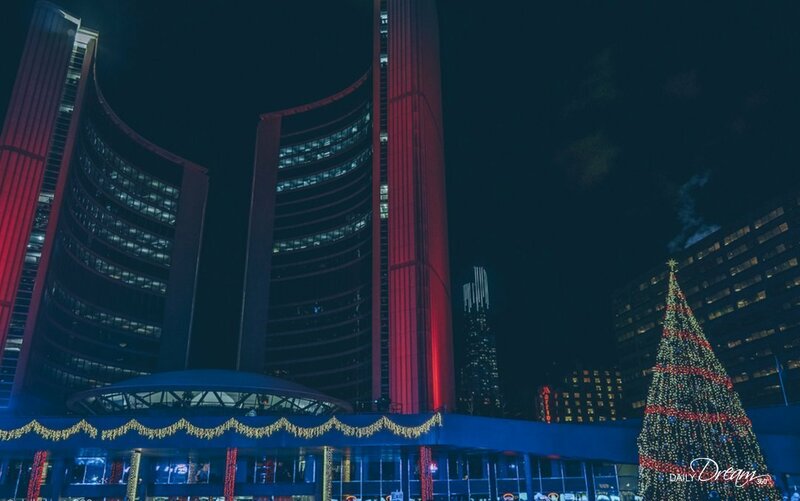 Bundle up and head to Nathan Phillips Square for an evening of musical performances, the Toronto Christmas Tree lighting and a fabulous fireworks display. For more on the Cavalcade of Lights see this post here. There are plenty of things to do in Toronto in December including some great Toronto Winter festivals. The Toronto Christmas Market has become a popular event here in the city. For six weeks, open Tuesday – Sunday little wooden huts filled with gifts and yummy treats line the streets of the neighbourhood. Carolers sing music is playing, and despite the cold weather you can’t help but fall into the holiday spirit. 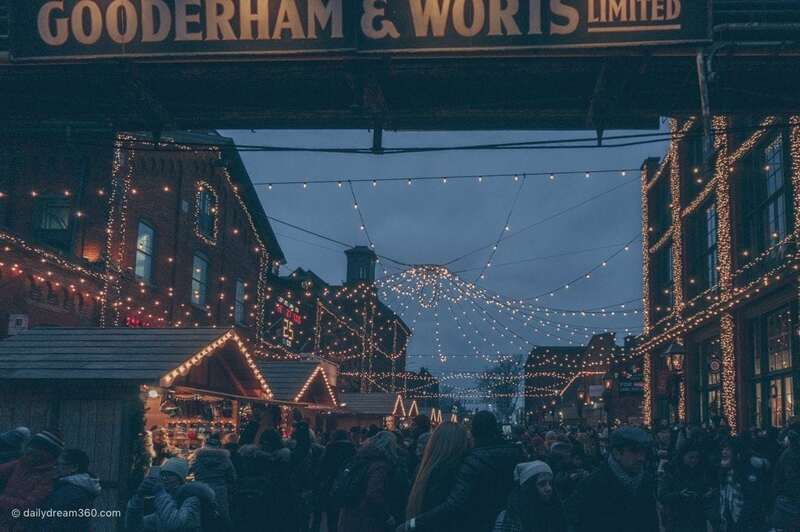 For a detailed look at the Toronto Christmas Market see our post here. 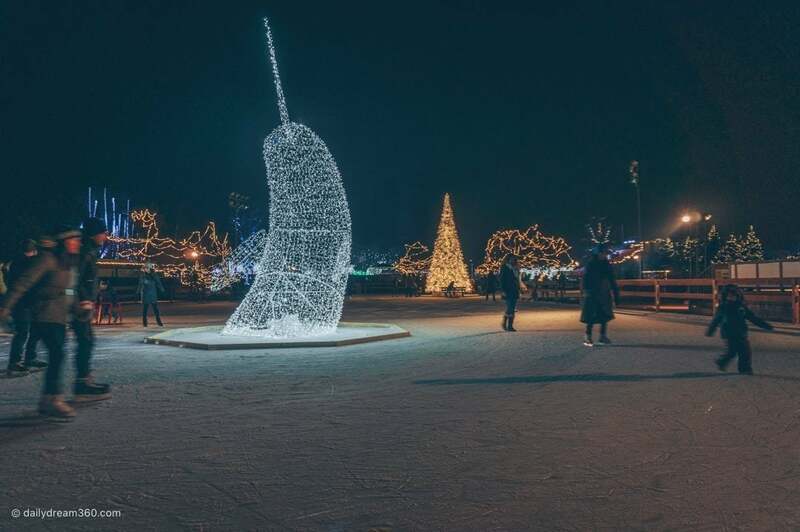 New this year is the first Aurora Winter Festival located at Ontario Place. Take a walk through the mystical forest, go for a skate or a ride down their tube sled. Keep an eye out for the dancing Yeti, and Santa and Mrs. Claus will be happy to pose for photos. 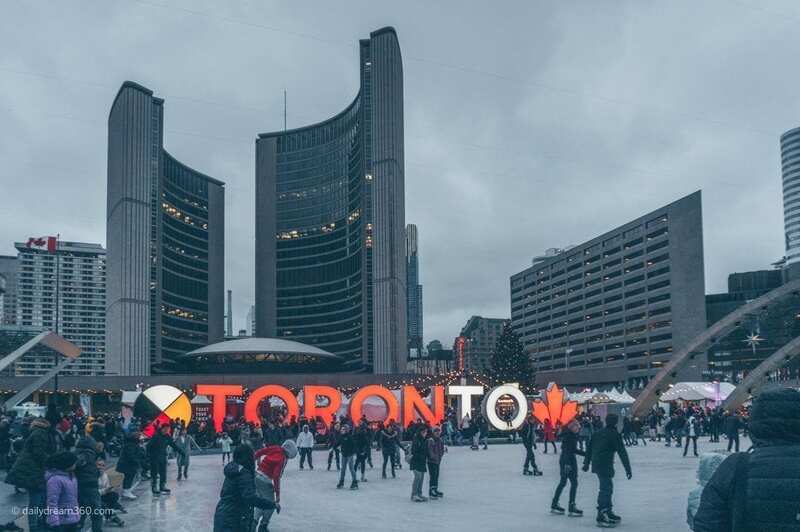 New this year, the group that brought the Buskerfest to Toronto has created the Toronto Holiday Market at Nathan Phillips Square. Be sure to add a donation to support Epilepsy and then browse the many booths for some holiday shopping. Grab a chair and warm up at the fireside lounge located by the skating rink. 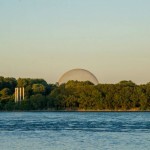 Many of Toronto’s attractions are also celebrating the holidays with special programming. 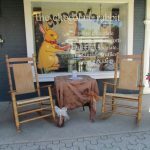 Most of us remember Black Creek Pioneer Village from our childhood visits. I forgot how fun it was to immerse myself in the little village museum that sets itself in Toronto and Ontario in the 1800s. During the holiday season, you can learn about Christmas traditions and how they evolved. Watch as bread is made in wood fire ovens, visit the general store. 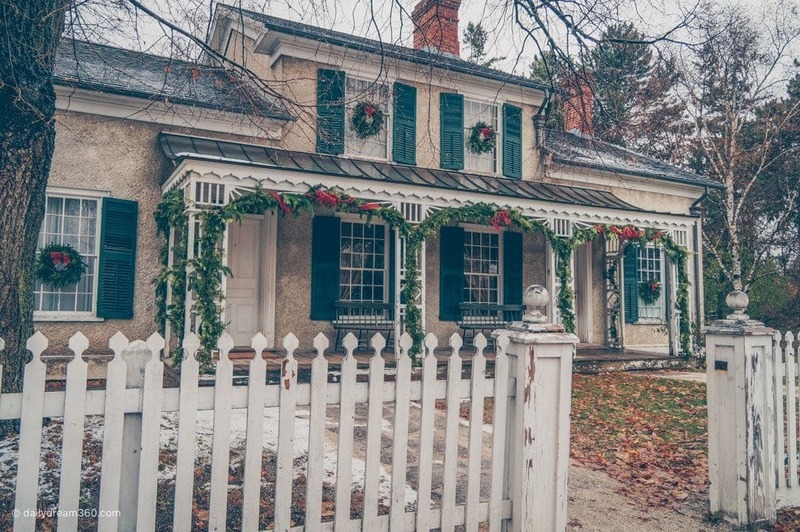 Each house demonstrates life during the holidays in the 1800s you may even find yourself huddled around a piano singing Christmas Carols. 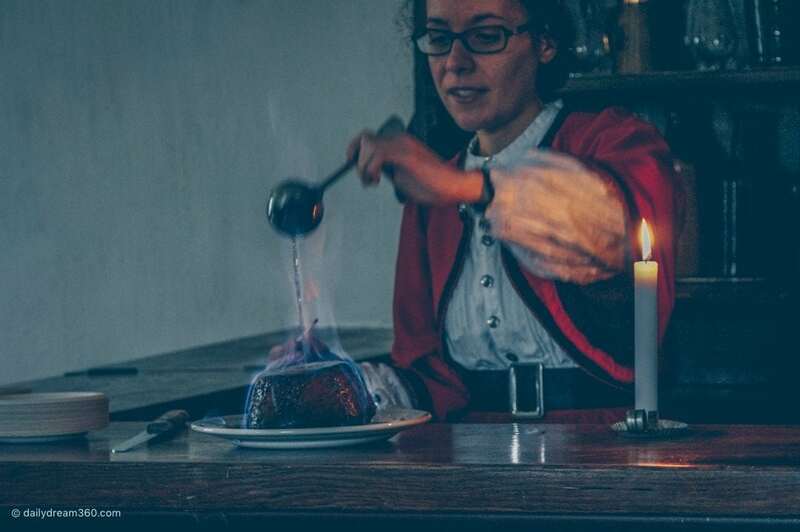 Be sure to enjoy some plum pudding, prepared the old way of course! Casa Loma is also known for getting into the holiday spirit. Inside top designers have lent their talents to decorating unique Christmas trees which can be found throughout the castle. From the great hall into the private bedrooms, you will see the various trees displayed. Be sure to take a walk outside in the gardens too. 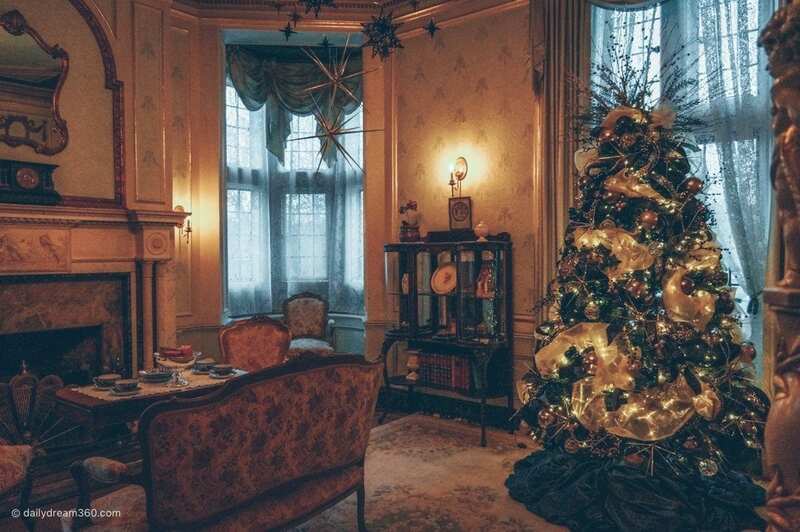 Casa Loma has special Winter Nights activities each Wednesday in December. 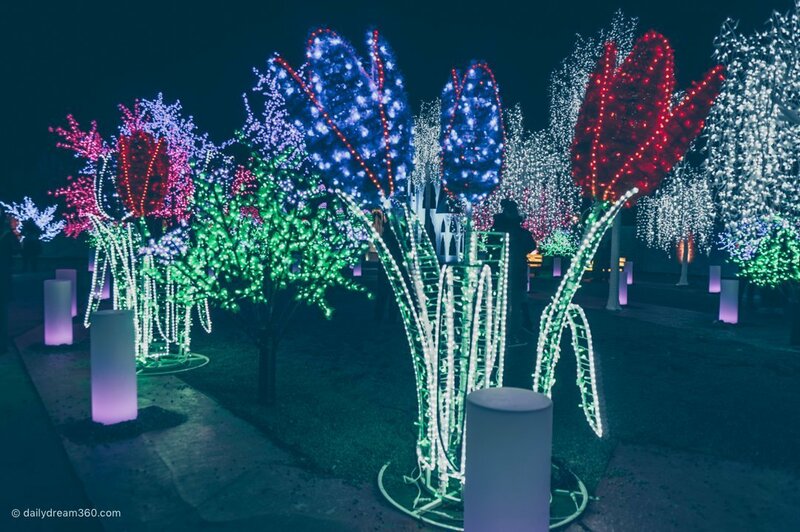 The gardens are lit up with lights, and there are musical performances and other fun events for the whole family. 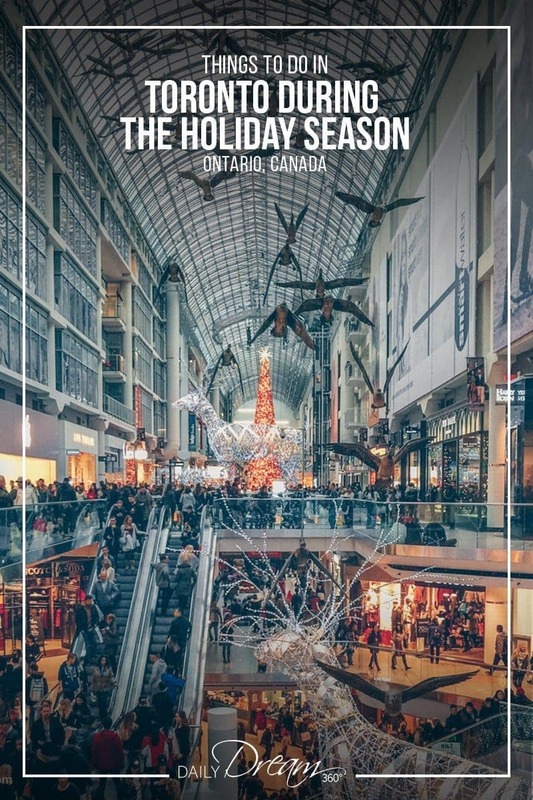 Even if you are not in the shopping mood, be sure to visit Toronto’s Eaton Centre during the holidays. They have great displays throughout the mall. The large Reindeer tower over shoppers in various sections in the mall and they have a 100 ft Christmas tree all lit up for the holidays. If you happen to be in the Eaton Centre, then be sure to make your way outside to see the Holiday Windows. A tradition in Toronto I remember coming down to see them each year as a kid with my family. 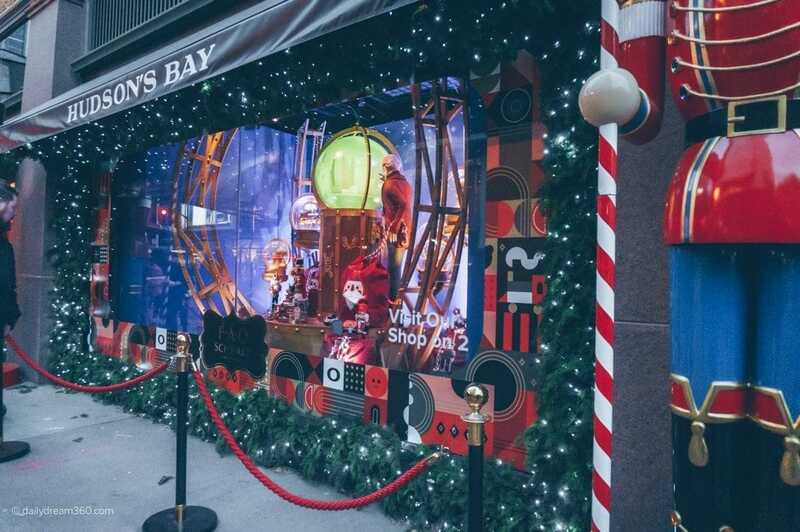 This year they teamed up with FAO Schwarz to create animated displays and holiday music that are a real hit with the kids. 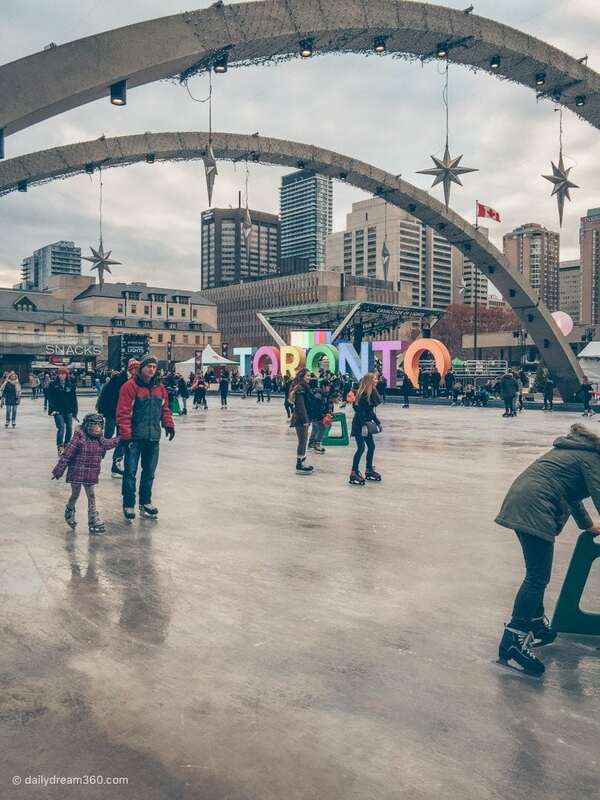 Once Toronto launches its Cavalcade of Lights celebration, it’s also a signal that Nathan Phillips Square’s outdoor ice rink is open for the winter. Decorated with our famous Toronto sign and lots of lights and holiday decorations, it too is a favourite holiday stop. Rent a pair of skates, grab some hot chocolate and enjoy a holiday skate day or night. Yorkville village is another great holiday destination in the city. 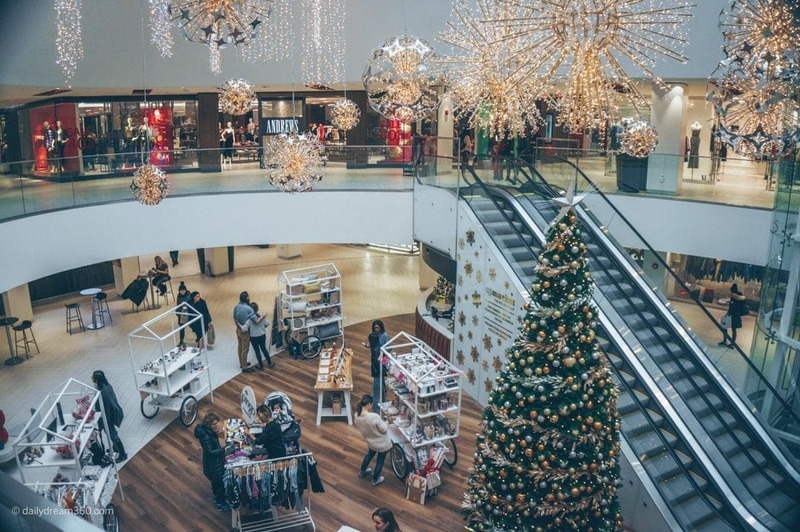 Even if you are not into the luxury shops, the neighbourhood is decorated with holiday cheer, and there are plenty of great cafes, restaurants and affordable shops to browse through. Head to King Street for a Holiday manicure and pedicure with the team at Her Majesty’s Pleasure. 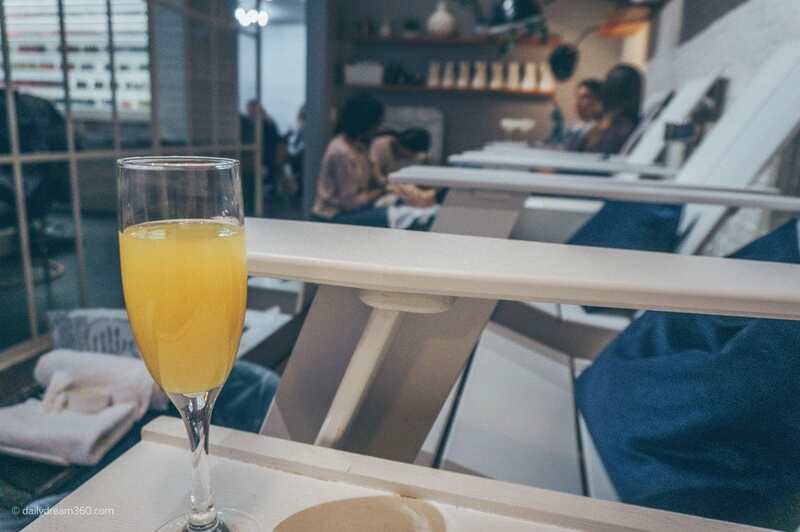 Enjoy a cocktail while their nail artists work on a special holiday manicure featuring the latest in nail trends. Need a holiday party dress or two this holiday season? Head to Commerce Court and have a style consultation with the team at Rent Frock Repeat. 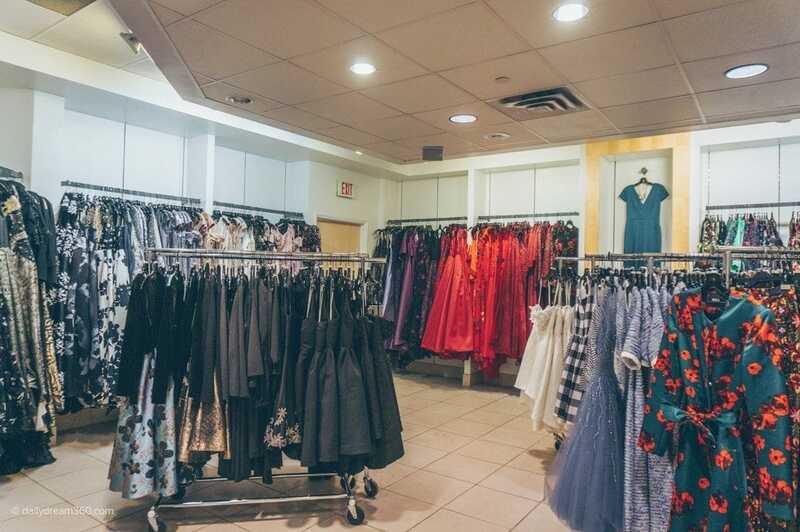 They have an impressive collection of designer cocktail dresses and gowns from size 0 – 22 and will do their best to set you up with the perfect styles for your body type. As I mentioned, Yorkville is a great neighbourhood to visit in Toronto during the holidays. 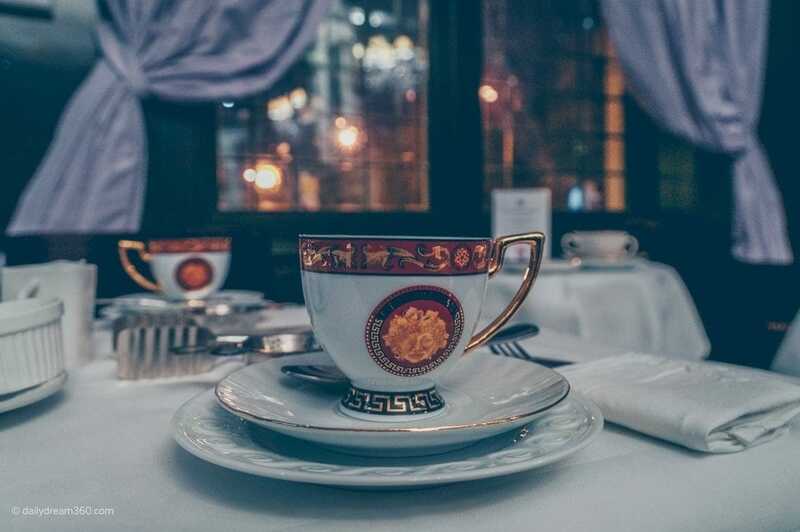 Many years ago I started a little holiday tradition with one of my girlfriends where we celebrated a little shopping getaway in the city which included high tea at the Windsor Arms Hotel. With holiday decorations sparkling outside the window, yummy eats, and hot tea it is a great way to end a Holiday day of discovering in Toronto. Travel assistance provided by Toronto Tourism on various media trips. 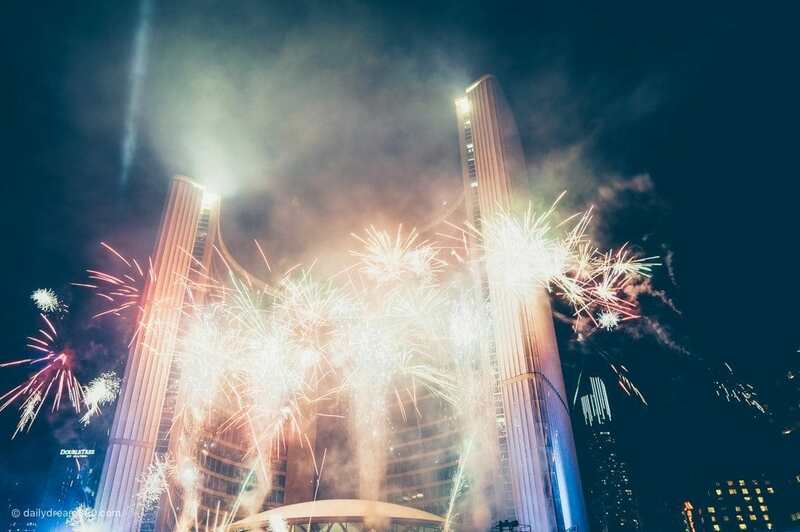 I spent the most recent New Year’s in Toronto and it was delightful. I’m looking forward to returning during the holiday season.